Original Editors -Nick Pucillo & Cody Russell from Bellarmine University's Pathophysiology of Complex Patient Problems project. Neurofibromatosis Type 1 (NF1) is an autosomal dominant disorder on the long arm of chromosome 17, characterized by predominately benign tumor growth on nerve sheathes called neurofibromas and cutaneous spotting called café-au-lait macules. The role of the mutated, naturally occurring protein neurofibromin is not fully understood but does appear to play some role in regulating Ras proteins which promote cell division and growth. NF1 varies a great deal in presentation and complications, even between immediate family members. 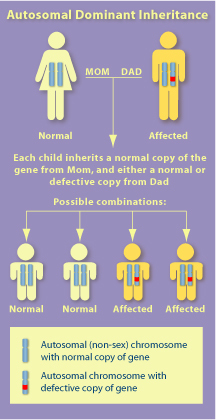 Neruofibromatosis type 1 affects approximately 1 in 3,000 peolple worldwide. 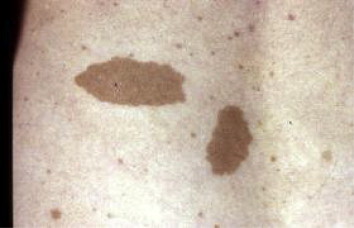 Neruofibromatosis occurs equally between sexes and races. 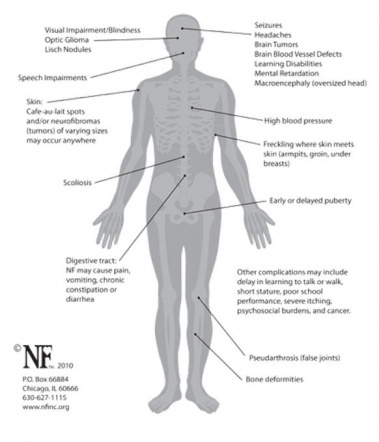 Neurofibromatosis type 1 has dermal, ocular, neoplastic, neurological, cardiovascular, and orthopedic manifestations. These various manifestations are what calls for aggressive treatment from a multidisciplinary team. Associated psychiatirc morbidity have been reported with NF1. Autism spectrum disorder and attention-deficit-hyperactivity disorder have shown to have a high prevalence with individuals with Neruofibramatosis type 1. Hypertension is also significantly associated with NF1. The leading cause of hypertensions in NF1 patients is due to the stenosis of the renal arteries which decrease blood flow to the kidneys. Six or more cafe au laite macules > 5 mm in prepubertal individuals and > 15 mm in diameter in adults. 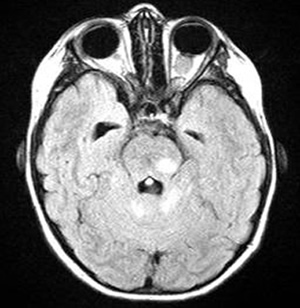 Optic glioma visual pathways tumors most often presenting as grade I pilocytic astrocytomas. Abnormal development of the spine (scoliosis), the sphenoid bone, or the tibia. Cardiovascular: Individuals with NF1 could have cardiovascular manifestations such as congenital heart disease, vasculopathy, and hypertension. Heart disease occurs at a higher than expected rate than the general public. Vasculopathies include stenosis, aneurysms, and arteriovenous malformations. High blood pressure is significantly associated with NF1. The most common cause of hypertension in the pediatric population is stenosis of the renal arteries. Blood pressure should be monitored annually. Best practice of physical therapy in individuals with NF1 has not been identified in research. Recognizing and treating impairments that manifest due to the underlying pathology is within our scope and should be considered when evaluating and treating a patient with NF1. As a profession it is important to recognize the manifestations and diagnostic criteria of NF1 in order to screen appropriately regarding orthopedic, neurological, cardiovascular, integumentary, and cognitive impairments. Physical therapy as conservative management for cervical pain and headaches in an adolescent with neurofibromatosis type 1: a case study. Effects of a plyometric training program for 3 children with neurofibromatosis type 1. ↑ 1.0 1.1 1.2 1.3 Julian N, Edwards NE, DeCrane S, Hingtgen CM. Neurofibromatosis 1: Diagnosis and Management. The Journal for Nurse Practitioners. 2014;10(1):30-35. ↑ Genetics Home Reference. 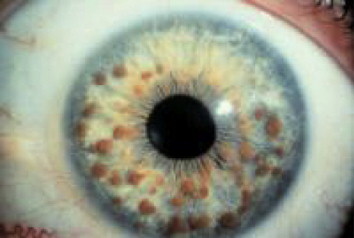 Neurofibromatosis type 1. Available at: http://ghr.nlm.nih.gov/condition/neurofibromatosis-type-1. Accessed March 4, 2014]. ↑ 3.00 3.01 3.02 3.03 3.04 3.05 3.06 3.07 3.08 3.09 3.10 3.11 3.12 3.13 3.14 Feldman DS, Jordan C, Fonseca L. Orthopaedic manifestations of neurofibromatosis type 1. J Am Acad Orthop Surg. 2010;18(6):346-57. ↑ 4.00 4.01 4.02 4.03 4.04 4.05 4.06 4.07 4.08 4.09 4.10 4.11 Boyd KP, Korf BR, Theos A. Neurofibromatosis type 1. J Am Acad Dermatol. 2009;61(1):1-14. ↑ Garg S, Lehtonen A, Huson SM, et al. Autism and other psychiatric comorbidity in neurofibromatosis type 1: evidence from a population-based study. Dev Med Child Neurol. 2013;55(2):139-45. ↑ 6.0 6.1 Williams VC, Lucas J, Babcock MA, Gutmann DH, Korf B, Maria BL. Neurofibromatosis type 1 revisited. Pediatrics. 2009;123(1):124-33. ↑ 7.0 7.1 emedicine.com. Accessed March 4, 2014]. ↑ 8.0 8.1 Ferner RE, Huson SM, Thomas N, et al. Guidelines for the diagnosis and management of individuals with neurofibromatosis 1. J Med Genet. 2007;44(2):81-8. ↑ Johnson BA, Macwilliams BA, Carey JC, Viskochil DH, D'astous JL, Stevenson DA. Motor proficiency in children with neurofibromatosis type 1. Pediatr Phys Ther. 2010;22(4):344-8. ↑ Rosalie E Ferner. 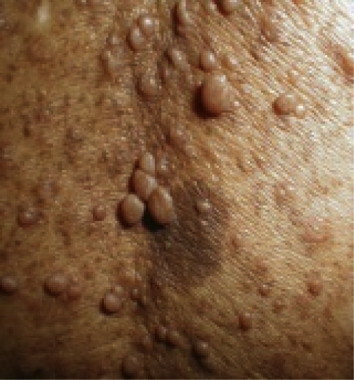 Neurofibromatosis 1. European Journal of Human Genetics. 2006;15(2):131. ↑ Johnson BA, Salzberg CL, Stevenson DA. Effects of a plyometric training program for 3 children with neurofibromatosis type 1. Pediatr Phys Ther. 2012;24(2):199-208. ↑ Helmers KM, Irwin KE. Physical therapy as conservative management for cervical pain and headaches in an adolescent with neurofibromatosis type 1: a case study. J Neurol Phys Ther. 2009;33(4):212-23.